This is the full and detailed view of the paperback HarperTorch 2002 edition of Skinwalkers announcing the production of the movie by PBS. This was the first PBS Mystery! episode set on US soil. At the top of the front cover in an orange band is the "SEE IT ON PBS MYSTERY!" announcement. Below is the author's name and book title in large dark green print. The back cover text is bracketed by drawings of plant-like pillars with characteristics of corn, topped by horizontal Yei figures. The text is a synopsis of the novel with praise for Tony Hillerman and Skinwalkers from the Los Angeles Times. 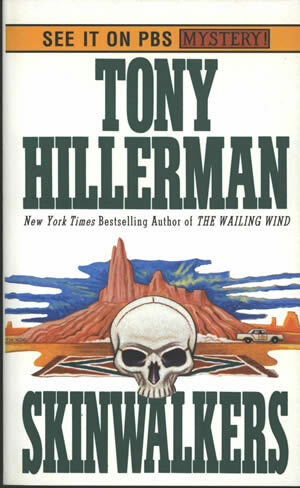 The title is printed horizontally in dark green print on the spine with Tony Hillerman's name in black. At the bottom of the spine is the PBS Logo and "SEE IT ON PBS." Binding: White paper covers with full-color printing.